The first spirit I ever tasted was gin. It was that obligatory illicit shot from your parents’ liquor cabinet, the “hmm, what’s this all about?” experimentation. And – UGH – that first sip was enough to put me off “Mother’s Ruin” for life. For years afterwards the smell would provoke an instant reaction of, well, ick. It’s unfortunate, really, as gin’s complexity is overlooked by many like me whose introduction was less than ideal. But this lady with a past (I love the old Hogarth engravings of depraved Gin Lane in the 1700′s) is beloved by mixologists and enjoying a revival. Case in point – New Heights restaurant has turned their downstairs bar into a gin joint, complete with a “Gin Manifesto” menu and gin flights. Wait, flights of gin? I just about fainted dead away when Rebecca first alerted us to this. In order to make it through a tasting without a PTSD attack, I needed back-up. It wasn’t hard to convince a gin-swilling friend – let’s call him Hogarth – to come along and help me get over the psychological trauma of my childhood sip, and enjoy a historic cocktail along the way. A quick word on ambiance. 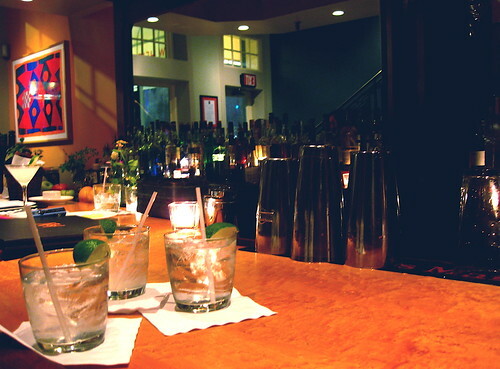 The small bar at New Heights is on street level, separate from the main restaurant upstairs. This makes it very conducive to chatting up your seatmates and the bartender in a relaxed environment. It’s elegant without any excessive frills, nicely lit, easy on the eyes and ears. The gin flights at New Heights (honestly, I did not mean to rhyme there, it just happened) consist of either three types of gin or three variations of gin and tonic. The selections will change depending on the season. Currently you can try a flight of Hendrick’s, Plymouth and Damrak on the straight gin side, and a flight of Broker’s/Fever Tree, Citadelle/Schweppes, and 209/Fever Tree Bitter Lemon for gin and tonic. Both flights are $14 and generous pours. Hogarth went right for the gin and tonic. “This is heaven,” he sighed as three glasses of G&T were lined up in front of him. “Hmmm, heaven. Right.” I was perusing the long list of about 30 different gins, each matched with a neat little description like “Iris root. Floral. Baking Spices. It’s Blue” (Magellan). Somehow that didn’t mesh with my childhood memory. I needed help. Time to interupt Hogarth’s blissful state and try a sip or two of his G&Ts. First, the Broker’s with Fever Tree. Surprise! Not too bad. I could manage it, smooth and not too heavy on the perfume. Next, the Citadelle with Schweppes. Aha! This is my awful gin memory right here, and now that I’m a seasoned boozy I can tell precisely why it freaked me out so much. Complex and floral, dense mouth feel. Viscous. Hogarth loved it, of course. Me, not so much. Finally, the 209 with Fever Tree Bitter Lemon. Sigh. Hogarth was waxing poetical about his muse, the perfection of gin, and I just couldn’t get it. That was when the miracle happened. 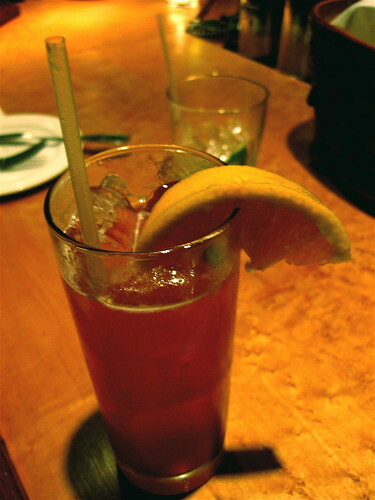 “How about an authentic Sloe Gin Fizz?” my bartending gin savior asked. He showed me the bottle of Plymouth Sloe Gin, explaining it’s gin infused with sloe berries. Looked innocent enough. He mixed it up with lemon juice, sugar and soda water. It was pretty. I took a sip. And another. And another. Plummy, but not too sweet, gently complex, with a little kick. Suddenly I was in a 1940′s movie about the Raj or on a Cunard cruise ship dressed like Hedy Lamarr. I felt like, well, an adult. Their Hendrix Sorbet is AMAZING. I’m a huge fan of this place.